(CNN) -- Entering his sixth year at Hogwarts, Harry Potter may not be able to see the finishing line, but he knows it's coming. 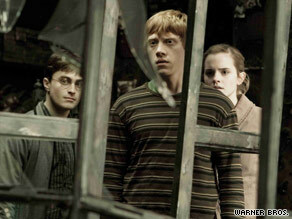 In "Harry Potter and the Half-Blood Prince," the trio of Harry, Ron and Hermione are on the trail of evil. In "Harry Potter and the Half-Blood Prince," the sixth film in the Potter series, he's like a marathon runner who senses that he's got this course beat: He's still pacing himself, but there's a definite spring in his step. Potter's confidence seems to be a product of Daniel Radcliffe's authority in the role as much as anything. He's decided he's the hero of the piece, and he's happy with that; Radcliffe plays him with such implacable conviction and such lightness, it's becoming harder to worry about the character's plight. This battered book of potions comes with scarily insightful scribbles by a former student, the titular half-blood prince, giving Potter a distinct edge over his classmates and that increasingly conflicted bleached blond, Draco Malfoy. More important, it also gets him in good with this installment's designated dodgy faculty member, Professor Horace Slughorn. We know the drill by now: Slughorn has special knowledge that Harry must prize out of him, while the teacher's own leanings remain tantalizingly ambiguous. A special guest star in all but name, Jim Broadbent plays this mildewed academic with appropriately Dickensian panache and an undertow of sympathy (first spotted disguised as an armchair, the suspiciously solicitous Slughorn maintains at least one foot in the closet). Adapted by Steve Kloves and directed (like Potter V, "The Order of the Phoenix") by the efficient, self-effacing David Yates, "Half-Blood Prince" is as brisk and nimble as J.K. Rowling's two-steps-forward, one-step-back narrative stratagems allow. A trio of evenly spaced set-pieces do generate enough excitement to make this an iffy proposition for parents with younger kids; in particular Dumbledore and Harry's climactic cave expedition is an intense, nightmarish standout. Soon it will be time to let these kids go and find their own way in the Muggle world, but what rich, strange and wonderful home movies we'll have to look back on. "Harry Potter and the Half-Blood Prince" is rated PG and runs 153 minutes. For Entertainment Weekly's review, click here.